Navigation assistance has the potential to reduce the progress of dementia by empowering people with dementia (PwD) and supporting their quality of life. Therefore the SiNDeM project aims to develop a recognition model of disoriented behavior in PwD. This enables the provision of situation-adaptive assistance strategies, supporting PwD in their autonomous outdoor activities. To analyze patterns of disorientation, we collect behavioral data using accelerometer, GPS (Global Positioning System), ECG (Electrocardiogram), and EDG (Electrodermogram). Therefore 13 probands with mild cognitive impairment to mild dementia are equipped with these sensors and asked to find the way back, after being accompanied by a psychologist in an orientation walk. Additionally, we ask probands to keep a mobility diary for 28 days. A developed ontology of disorientation supports the annotation of the video-taped walks and the reasoning about adaptive assistance. 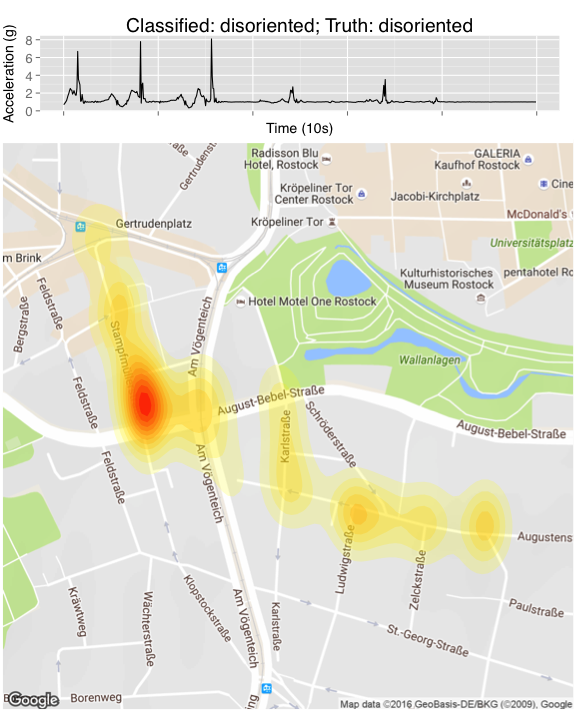 To provide further contextual data, cognitive models are harnessed and integrated with the sensors‘ observation model using CCBM (Computational Causal Behavior Models). Such extended information about a person’s current state and environmental situation, supports the recognition of disorientation and the provision of situation-adaptive assistance. P. Koldrack, R. Henkel, F. Krüger, S. Teipel, T. Kirste. Supporting situation awareness of dementia patients in outdoor environments. In Proceedings of the 9th International Conference on Pervasive Computing Technologies for Healthcare, pp. 245-248, 2015.